Trying to budget for the number of staff that you need to answer incoming telephone calls can be difficult. Not only do you need to work out how effective your marketing campaign is but you also need to estimate the length of time your callers will be on the phone, how well your existing staff will be able to manage those calls and any potential impact from sickness, holidays etc etc. Nothing is linear in business and inevitably you will end up having too many people or too few people to handle the job at hand. Wouldn't it be easier if you could instantly bring people in when you need them or instantly lay people off when you don't. Rather than trying to manage the whole thing in house why not outsource some of those hard to predict spikes by using VirtualOffice.Melbourne for your overflow. The way it could work is really quite simple. You simply set your existing PABX or PBX to forward calls that are not answered within 2 or 3 calls to us. Our professional receptionists would answer those calls as though they were your in-house staff. They would answer the calls with a pre-agreed greeting and then either forward that call on to a number that you have provided or they would take a message that could be emailed to one or more email addresses at your business. Think of how much difference this will make to your business. No longer will you have to worry about covering for your staff during lunch or when one of them rings in sick. During holiday periods you won't have to bring in a temp, you can simply redirect a staff members phone to our overflow service. Why should I pick Virtual Office Melbourne? Here are some of the main reasons why you should choose Virtual Office Melbourne. We have the pedigree. We answer calls for more than 7,000 customers around the world. We understand what it takes to provide first class answering services and we deliver for our customers. Our systems have been written by Australian developers for Australian businesses. Our systems are extremely intuitive to use and if you don't feel like logging in you can simply give our customer support staff a call and we can handle everything over the phone. We will take the worry out of receiving overflow calls. You can focus your attention on managing your business not managing your incoming calls. It is really quite affordable. We have a range of packages depending on your call volume. Many of our customers report saving as much as 50% off the cost of a full time employee by utilising our services for the same number of calls. We won't lock you in to a long term contract. We keep our customers because we provide a great level of service. You can leave with just a months notice. Unlike some of our competitors we don't outsource our phone answering to cheap call centres in Asia or India. With VirtualOffice.Melbourne your overflow calls will be answered by professional trained receptionists who are located in Australia. We believe that it makes a huge difference to the level of service that we can offer if we have local experienced receptionists who understand the Australian business environment and understand how Australian businesses work. We don't just have to answer your calls. Our receptionists can act as the gate keeper to your business and filter out all of those annoying telemarketing calls. You can also set up hunt lists of numbers where if one person is not available then a call is forwarded to the next person on the list and so on. You don't need a PC or laptop to manage your account. With our easy to use Android and iPhone apps you can log in to your account from your smart phone and make whatever changes are needed. You can easily switch from us answering your calls back to calls being forwarded through to you. Getting started with Virtual Office Melbourne is really easy. You just need to divert your existing number or 1300 number to a phone number that we provide and provide us with instructions in terms of how you want us to handle the calls. What if I need a local Melbourne number? 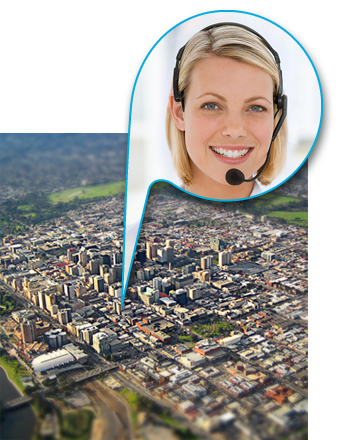 We can provide you with local telephone numbers for all major cities in Australia. If you don't have a local Melbourne number then we can provide you with one. We can also provide you with local phone numbers for all major cities in Australia. Why not get one in each of the capital cities and make your business look national! We carry a stock of 1300 numbers that are available for quite reasonable rates. A really good benefit of our 1300 numbers is that you pay one fee that then covers you for included minutes. 1300 numbers are a great way to make your business look national and to encourage people to call. What will my customers hear when they call? All of our customers have a customised greeting that is used when our professional receptionists answer incoming calls. This greeting can be whatever you want it to be and can be changed whenever you like. Many of our customers opt for a simple "Good morning/afternoon (Company Name), (Receptionists Name) speaking. How can I help you." while others like to make the greeting a little more personal and more focused on what the business is doing. You can receive your messages either by SMS or by email. In these days of smart phones we tend to find that the majority of our customers have their messages emailed to their phones as they can then act on the message when they have available time. If it is an urgent message then you may want to respond immediately whilst if it is a not so urgent message you may respond when you get back to your office. I'm not sure which of the packages to choose? No problem, during the 7 day free trial you don't need to lock in to a specific package. After the free trial is finished our customer care agents will be very happy to help you choose which package suits your business best. Also, once your account is operational you can upgrade or downgrade your package at any time. We like to make it easy for our customers. Our customers range from small one man bands to large divisions of listed companies. The types of businesses that use our services include lawyers and legal service companies, accounting practices, IT consultants, digital marketing agencies, trades people, eCommerce companies and startups. Whatever your industry and whatever your location we have the professional receptionists available to answer those important incoming telephone calls. You can test out our system for 7 days with absolutely no obligation. We don't even require a credit card to secure your trial. What have you got to lose, test us out today!